Take a look at our beautiful rental homes in Bend, Oregon! Our homes range up to five bedrooms and comfortably sleep up to twelve guests. Our vacation rentals offer stellar amenities such as complimentary WiFi, washer/dryer units, parking, fireplaces, both private and community pools and hot tubs. Check out our pet-friendly rentals and bring your four-legged fur baby along with you. We even have properties with breathtaking panoramic river views with walkable river access, and homes that are a short walk from downtown Bend, Oregon. Be sure to also take a look at our lovely rentals at the Mt. Bachelor Village Resort as well. 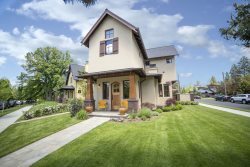 View our full collection of Bend Oregon vacation rentals and let us know how we can help make your reservation and visit Bend Oregon an unforgettable, positive experience NO BOOKING FEES! Bend Oregon Vacation Lodging Home, Private Hot Tub, Fenced Yard, Walk to Downtown Bend & All Over West Side! Drake Cottage Bend, Oregon Vacation Ski Rentals Pets Ok! WiFi Walk All Over Downtown and West Side of Bend! NO BOOKING FEES! Bend Oregon River Wild Vacation Rental, 4 bedroom and Media Room Sleeps 10 Air Conditioning, Pool and Hot Tub! Bend Oregon River Wild Pet Friendly Vacation Rental, 4 bedroom and Media Room Sleeps 10 Air Conditioning, Pool and Hot Tub! Downtown Bend Oregon Pet Friendly Vacation Rental Hot Tub, Fenced Yard, Close to Old Mill District, Walk Everywhere! River Wild Mt. Bachelor Village, Mt. Bachelor Ski Resort WiFi Fireplace Hot Tub and Swimming Pool, Pet Free! Panoramic Views, Absolutely Gorgeous Five Bedroom Vacation Home, Minutes to Downtown Bend Oregon, sleeps 12, Pet Free! Downtown Bend Oregon Vacation Rental NW Fifth Street, sleeps 8 Walk Everywhere! Meadowbrook Drive 2 sleeps 8, Easy Access to Downtown Bend Oregon, Close to Mt. Bachelor Ski Resort!